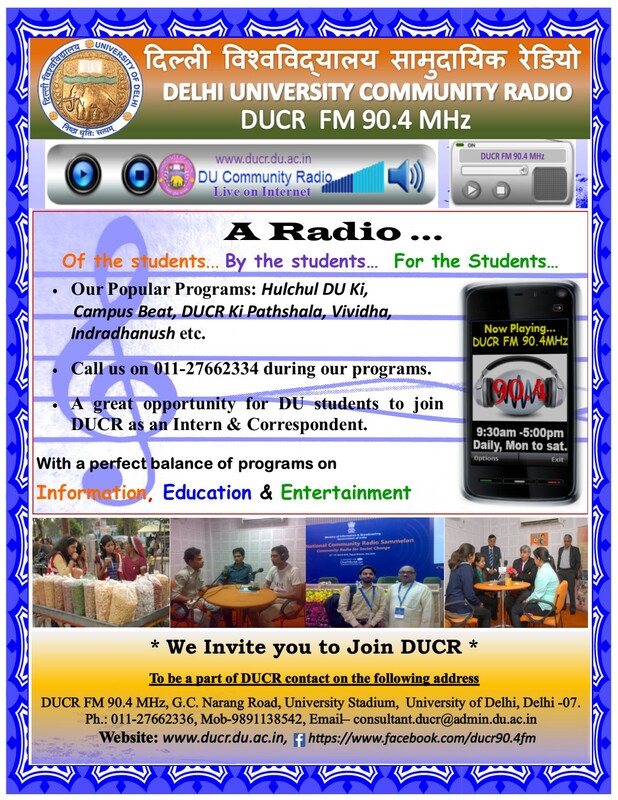 Delhi University Community Radio, DUCR 90.4 MHz was established in 2007, is a Community Radio Station situated inside the University stadium, University of Delhi. It was inaugurated by Sh. Kapil Sibal, then Honourable Minister of Science & Technology and Minister of Earth Sciences, Government of India on 2 October 2007 in the presence of Prof. Deepak Pental, Hon'ble Vice Chancellor of the University of Delhi. Prof Pental emphasized that the larger participation of faculty and students will strengthen the DUCR and make it popular among the community residing in and around University Campus. In early days of broadcasting some experts and professional presenters were involved but after getting matured enough, now Community Radio Station is managed by the students of University of Delhi as directed by the Hon’ble Vice Chancellor Prof. Dinesh Singh. DUCR is functioning under the supervision of R.K Singh Consultant, DUCR (Technical and Program) former Engineer-in-Chief of Doordarshan. The main thrust area of DUCR 90.4 MHz is to broadcast student centric community based programmes. In addition to these programme music and songs are also introduced into it to make programme more interesting. We are very careful about the proper proportion of education, information and entertainment in the broadcasting programme. Some special programmes are also introduced at time to time as per the requirement like in 2008; the University started using the station for disseminating information about the admission process, through live phone-in programs in admission season. In the month of March 2014 the whole journey of Gyanodaya Express - An Educational Train Journey of University of Delhi was covered by the media team of DUCR consisting of students only. As per the growing popularity and demand of the listeners, DUCR is available on DU Intranet and Internet also. 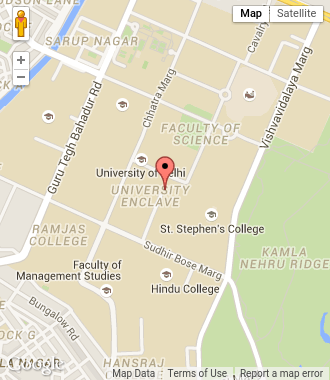 For more details visit :- Delhi University Community RadioWebsite.